Had a little fun and helped my friend Traci out. She is having a Halloween party for her son, Connor and his friends this weekend. 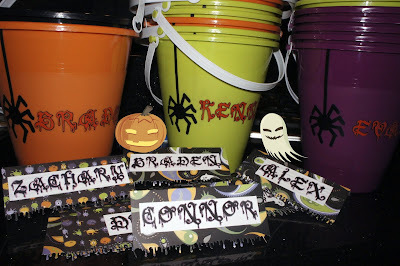 I made her some Treat Bag toppers and added the kids names and a spider to the buckets that she bought. The kids are going to decorate the buckets more at the party along with a whole bunch of other things Traci has planned. She is a great mom and a fellow Cricut addict too! 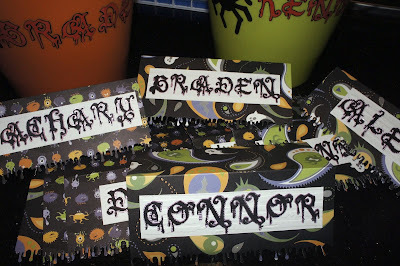 But, sometimes it is hard to plan the party, be the mom and Cricut--so I added a little help. Aren't Halloween projects the best? I know how it is to be pulled in so many different directions and the need to create overpowers it ALL! Great job. Love that font.